Mila loved the blossom at the top pf her new potty bell so much that I eventually detached it and gave it to her as a toy. With Mila I am using a potty bell and both of us find that very convenient. She has the chance to let me know whenever she needs to go outside for potty business and I benefit by not having scratched doors or “oopsie’s” in the house. Choosing the right potty bell will depend on your dog. 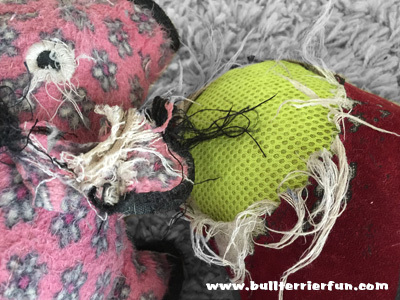 If your dog likes toys, in general I would suggest to stay away from those cute “toy-style” ones. Chances are high that your dog will mistake it as a toy and try to play with it once you leave it outside within your dog’s reach. I made the “mistake” to order this one. Mila fell so madly in love with that little blossom at the top that she tried to play with it all the time. Eventually I gave in and detached the blossom and gave it to her as a toy – to this day she loves and cherishes it. 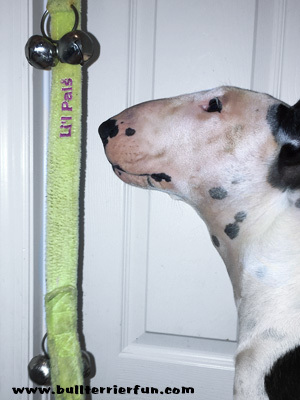 Learn how I trained her to operate the potty bell in this essay. Dog trick training is always the best when additional benefits result from it in addition to just having fun and a good time together. Teaching your dog how to operate a potty bell is a pretty handy trick. This gives your dog a way to get your attention when she needs to go outside for potty business. It can also save doors from being scratched and floors from being soiled by “oopsie’s”. It is a fairly simple and practical exercise for your dog. There are different solutions available, such as bells to operate with the paws or the nose. I am introducing some different product in this essay. I am using a potty bell that Mila touches with her nose. But teaching the dog to operate a bell with the paws works after the same principle. In order learn how to operate a potty bell with her nose or her paw, it is helpful, if she knows the “Touch” command already (touching things with her nose). If you want her to operate the bell with the paws it may as well be helpful, if your dog knows, for example, the “shake hands” trick (putting her paw into your hand) already. Teaching your dog the “touch” command = touching things with the nose or paw is a fairly easy and basic trick that comes in handy for many different things. It is also called “target training” for obvious reasons, because you teach your dog to target something, such as your hand. This dog trick is a good basis,for example, for teaching your dog how to use a potty bell. 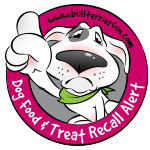 Reason: Smallbatch Pets Inc. is voluntarily recalling one lot of frozen dog Duckbatch Sliders because of potential contamination with Salmonella bacteria and Listeria monocytogenes. Is that the Easter Bunny … or what – Happy Easter! Reason: Fromm Family Foods of Mequon, Wisconsin is voluntarily recalling three of its canned dog foods because of a possibly elevated content of vitamin D.
Reason: Nestle Purina is voluntarily recalling Beneful and Purina Pro Plan wet dog foods because their own tests revealed that the affected dog foods did not contain the recommended level of vitamins and minerals. 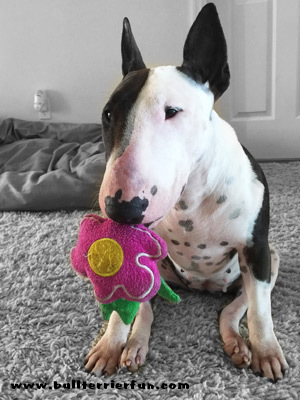 My Bull Terrier Mila is a very creative little pooch. I don’t think her next trick will be juggling her balls. That’s probably too tricky to do with just paws. But the games she plays with her balls … Recently she re-invented dog fetching in the swimming pool. This may be the pride of the dog owner speaking, but it’s really fascinating and hilarious at the same time, how she manages to conquer her balls with patience and devotion. Mila only managed to do this two or three times so far in the water. But she keeps practicing passionately to tackle this task, which she completely assigned to herself on her own. And I only managed to record it once! See for yourself.